Hey - we actually saw Eric this week! Dude works too much. But he took off on Wednesday so that we could celebrate Mother's Day belatedly. We went to Grimaldi's Pizza (yes, there is one in our town!) for lunch. I did not adhere to my Sugar Detox that day. I enjoyed mucho pizza and wine. After lunch we went to Home Depot to look at some plants. Lila ran around for a while and then we went back to the car to wait for Eric to finish up. When we got home, Eric built a container in the backyard for us to grow vegetables - I'm so excited! Our yard is actually looking pretty good, which is amazing considering we really don't know what we are doing when it comes to gardening. On Thursday, Lila had her 18 month wellness check. She now weighs in at 23 lbs and is 31.5 inches tall. 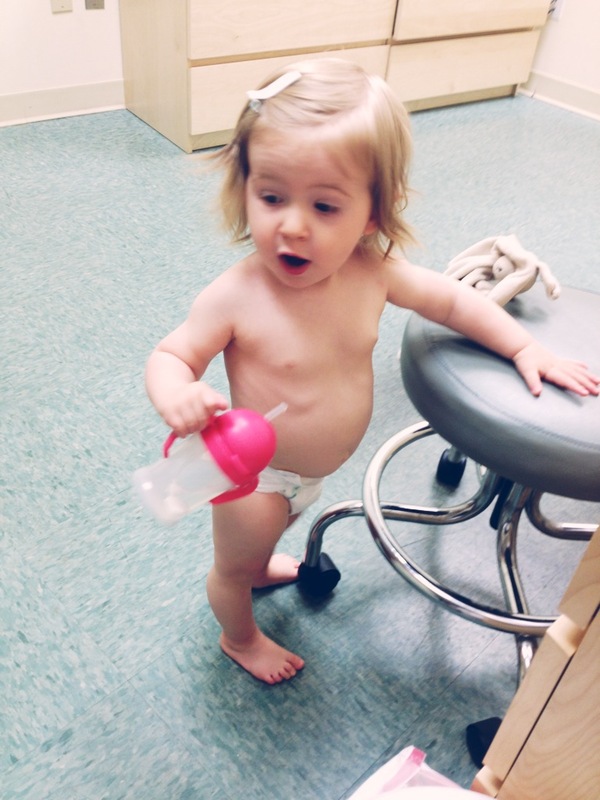 She's about 30th percentile for height and weight, but her head is in the 97th percentile! Big brains! Her doctor said she is right on track developmentally, and that she doesn't have to have any more shots (besides her yearly flu shot) until age 4! Woot! On Friday Lila had music class. I really noticed this week how much her comprehension is growing. She was following directions just by hearing the words, and not having to be shown what to do - stomping her feet on command, clapping on command. It was really cool to see. She's signing up a storm, too. Just this morning I was quizzing her on signs, and I realize she knows way more than I thought she did. After music class we had lunch at Panera. I bought Lila a cookie but she wanted my apple instead! She ate almost the whole thing! It was hot that day, so later at home I gave Lila her first popsicle. Probably a mistake to have in the house - there were little red drips everywhere! She loved it, though. The weather has been seriously schizophrenic this week - one day its sunny, the next day its rainy. Its been warm everyday though and HUMID! Oh boy, we need to put our air conditioners in the windows soon. Rainy days are not Lila's favorite. She hates being cooped up inside. The house usually takes a beating. Lila's climbing skills are getting too good. She has no problem getting up on the couch now. I found her up on the window sill with Tallulah the other day! Here's Lila trying to dress her doll. Eric's mom texted me this photo the other day when I was at work. So cute! I love Manhattan in early summer before it gets too stinky. We got the lamest fan letter ever the other day at work. It was denied. I leave you with some really cute bedhead. Have a great week!